PHILADELPHIA -- Meek Mill's imprisonment on a probation violation set off a flurry of legal appeals, criticism of the criminal justice system, newspaper opinion pieces, rallies, billboards and bus ads. A look at how the 30-year-old Philadelphia rapper, whose "Dreams Worth More Than Money" won a Billboard award for top rap album in 2016, ended up in a Pennsylvania prison roughly a decade after his 2007 arrest and then rang the bell at the Philadelphia 76ers playoff game hours after being released. JANUARY 2009: He is sentenced to 11- to 23 months behind bars, seven years of probation. Common Pleas Judge Genece Brinkley says the term was "considerably shorter" than it could have been. She wrote that the court wanted to "give him an opportunity to turn his life around from selling drugs and instead focus on his musical talent." Rapper Meek Mill must serve three months of house arrest for parole violations that he blames on his erratic concert schedule but Philadelphia prosecutors link to his romance with Nicki Minaj. NOV. 6, 2017: Brinkley sentences Mill to two to four years in prison for violating probation. She cites a failed drug test, failure to comply with an order restricting his travel and two other unrelated arrests - one in St. Louis for a fight in an airport where charges against him were later dropped and the other for reckless driving in New York City where he took a dismissal deal. Fans, athletes and fellow rappers take to the streets in Center City, calling for Mill's sentence to be overturned. Civil rights leader Reverend Al Sharpton visits Mill in the Chester, Delaware County prison. "We had a very blunt talk," Sharpton says. "He's a bright young man. He's committed and he really said 'Reverend, if nothing else, let people understand what this system does.'" Brinkley denies a motion to allow the 30-year-old rapper to be bailed out. She says Mill will stay in prison because he's a "danger to the community." Mill's legal team asks again an appeals court to free him from prison. Brinkley hires her own lawyer. Attorney A. Charles Peruto Jr. says the rapper's legal team has been making baseless claims to the media about the judge's personal and professional conduct. Prosecutors in Philadelphia say they are not opposed to the release of Mill while he appeals a probation violation sentence, citing concerns about whether his conviction will ultimately be upheld. They confirm that the arresting officer was among those prosecutors from the previous administration tried to keep off the witness stand because of credibility questions. They cite accusations against him by other officers in saying there was "a strong showing of likelihood" of the conviction "being reversed (in whole or in part)." 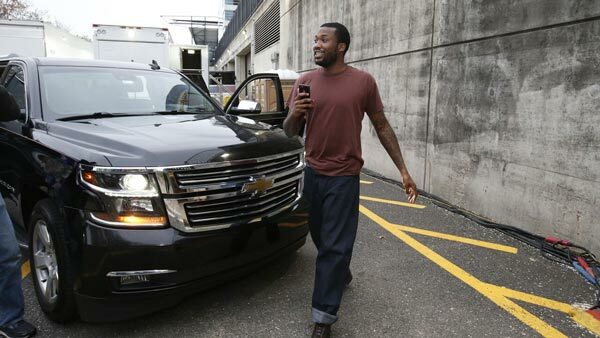 Prosecutors unopposed to Meek Mill's release. Matt O'Donnell reports during Action News Mornings on March 15, 2018. District Attorney Larry Krasner informs the Pennsylvania Supreme Court that he will not oppose bail for Mill, pending proceedings against him. New England Patriots owner Robert Kraft and Philadelphia 76ers co-owner Michael Rubin visit Mill in prison. After the visit, Kraft says Mill's incarceration makes it clear that "we have to do something with criminal justice reform." Rubin says he believes "the right thing will happen" and Mill will be released soon. Philadelphia Mayor Jim Kenney visits Mill in prison. "I think nationwide we need to look at how we handle criminal justice issues and how we treat people when they're younger and shouldn't follow them when they're older. They have responsibilities to take care of children, child in this case, and be better off doing that if he went to work," Kenney says. The Philadelphia district attorney's office says during a hearing the drug and gun convictions should be thrown out and Mill should be granted a new trial. District attorney says Meek Mill convictions should be tossed. Sarah Bloomquist reports during Action News at 5pm on April 16, 2018. Comedian Kevin Hart meets Mill in prison and decries multi-year prison sentences for probation violations. "He's doing good considering the situation. It's jail. You can be as good as you can be. His mind is right, and that's what I'm concerned with, that's why I came to see him," Hart says. "When you know you're innocent, it's tough to sit through something you know you didn't do." Kevin Hart speaks to media after visiting Meek Mill in prison. Watch his news conference from April 24, 2018. The state Supreme Court directs the judge to immediately issue an order releasing Mill on unsecured bail. Mill walks out of prison and into a waiting helicopter. He attends the Philadelphia 76ers game where he rings the ceremonial bell. Mill says he would now focus his attention on getting his convictions overturned, and that he looks forward to resuming his music career. The Supreme Court denies a defense request to move the case to another judge, but says the presiding judge could opt to remove herself.